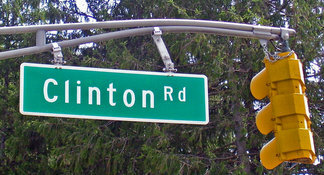 One particular road in New Jersey that has gained the reputation as that of being a haunted road due to the numerous and frequent reports made by many individuals of what they believe to be supernatural or paranormal activity that span a time period of well over a century, is an approximate ten mile stretch of road in the township of West Milford known as "Clinton Road". Many of these experiences of have been featured in books and magazines including "Convergence: When the Living Clash with the Dead" and "Weird NJ". While there are many reportedly haunted roads across the globe, this road has received a great deal of notoriety not only for the stories of paranormal sightings, but also for other claims made by individuals of activities such as the worshipping of Satan, the practice of Witchcraft, and sightings of unidentified creatures. 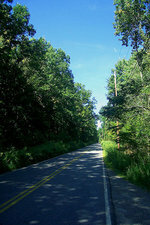 One of the more frequently told of the numerous stories involving this haunted road surrounded by woods and located in Passaic County in northern New Jersey is that of the ghost of a boy who - according to legend - died tragically when he fell from a bridge near what many people have referred to as “dead mans curve”. Legend has it that when tossing a coin from this bridge into the water, it will be thrown back out by the “ghost boy”. While some claim that they have seen his apparition, others claim to have seen only a reflection of a boys face in the water. Another story that is told frequently revolves around that of the sighting of a “ghost truck”. This truck is said to suddenly appear out of nowhere late at night following closely behind only to vanish momentarily and reappear again until the vehicle that is being followed reaches the main road where the truck then seemingly vanishes out of sight. Not only is Clinton road well known for its reputation as being a haunted road, there have also been many reports made by individuals claiming to have seen creatures that they were unable to identify. These include descriptions of “wolf-like” creatures or “hell hounds” similar to those that have been described by individuals traveling along Route 666. There are also stories that have been told by some of the young locals of a very large creature that has many features resembling that of a bat. Other stories include that of a white wolf with eyes that appear to glow red. In the early 1900s, a man by the name of Richard Cross built a stone mansion that became known as “Cross Castle”. This property was purchased sometime around the era of the Great Depression by the city of Newark and at some point the structure become partly destroyed a fire. The seclusion of this area made it a popular spot for many of the locals in the area – particularly the younger individuals - to gather and camp out or party. Many individuals believe that this was also the site for satanic rituals and that graffiti found on the walls of the structure that were still standing were indicative of this type of practice. What was left of the structure was deliberately demolished or “razed” by the “Newark Watershed Conservation and Development Corporation” resulting in only the foundations remaining. There are stories circulating of individuals experiencing strange phenomena when present at the site of these ruins such as the unexplained bruising of areas on their body or having strange visions. These are just a handful of the numerous stories of unexplained phenomena that have been told for well over a century pertaining to this haunted road. While some of these stories may be simply urban legends passed down through generations or some the product of an over active imagination given the nature of the isolated area surrounding the road itself, the cumulative amount of unusual experiences told by many different individuals suggests that this particular thoroughfare located in northern New Jersey may indeed be a haunted road.